What year is your B-20 ? Mine is a 2007 and has the hydraulic log dog (clamp). If your's is older and/or doesn't have that function I could get photos of the factory-style setup for you. I think you've seen mine before its modified with a push pull marine type steering cable I have 4-1/2" of max. Height. Been working really good for me. Tom, any photo's would be greatly appreciated,thanks. Mine is a 2000 mod. Where are they pulling hyd. from? Main stack or diverted? Jeff, thanks for the photos, I had already looked at yours, simple but efficient. I scored a 1x9 cylinder for 0$ so thought that's the way I would go. I think I have a divert valve and spool here too. 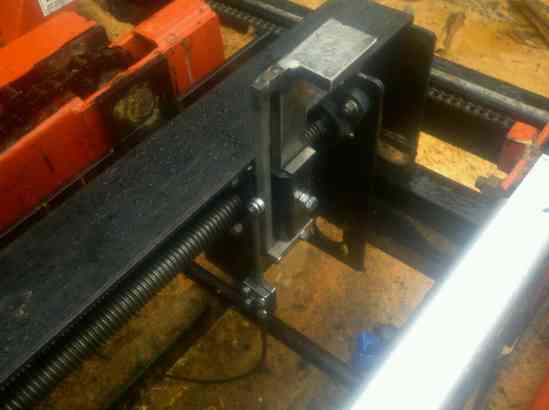 There are some pics of the TK 2000 clamp in my gallery in the "TK2000 mods" album if you'd like to see how that's set up. Keith I considered putting a cylinder on it but the acme screw could bend or weaken if you are thinking of lifting with it. Also if it dosen't give when a can't or a stack of boards your edging falls on it, that could be a problem. Mine gives real easy and don't have to worry if something falls or drops on it. 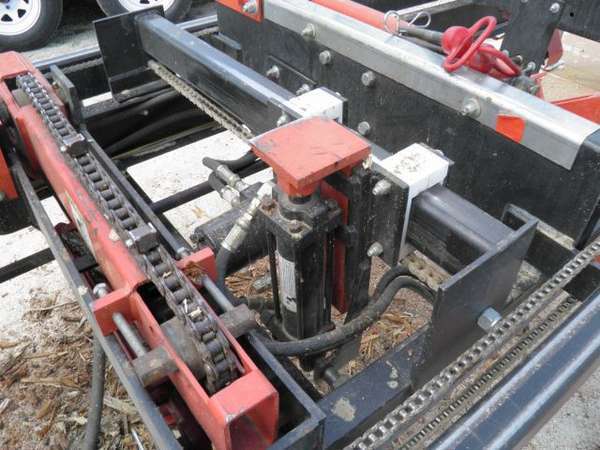 Also my log clamp doesn't flip down like TK design its fixed to just fully retract below bunks. I was on a job today and was able to snap some pics. If you need a closeup of any part of the system just let me know. 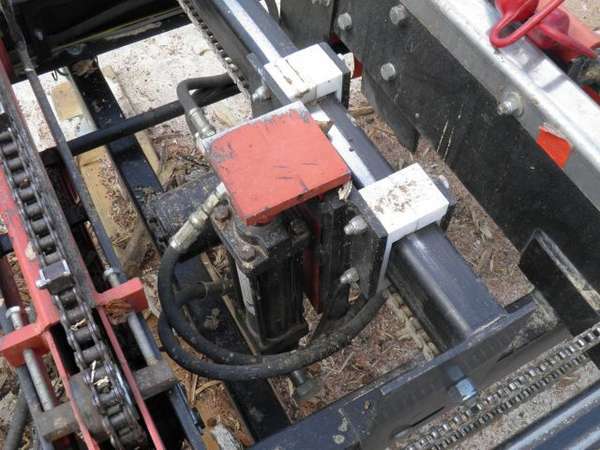 There is a hydraulic motor that moves the dog in and out to clamp the log and a hydraulic cylinder that moves the dog up and down to regulate the height. 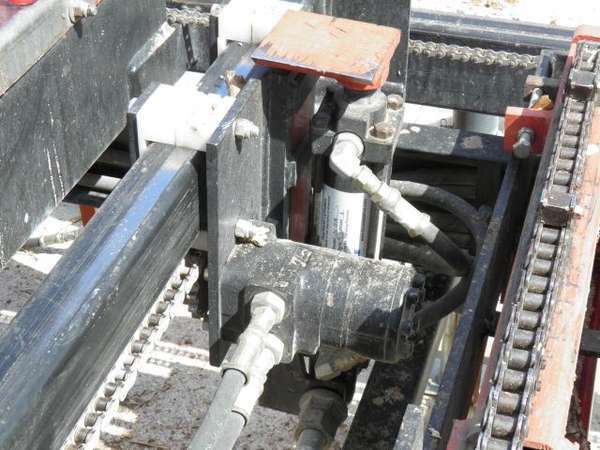 Both are plumbed directly to the bank of levers at the operator's station. Is that design heavy enough to flip a cant? So you don't have to use log turner. And does it have enough power to pull log over against the log stops. I have 1996 B20 and do not like the acme screw design. Thinking about building a new log dog. Tom's clamp looks to be the same as the one TK is putting on the 2000. 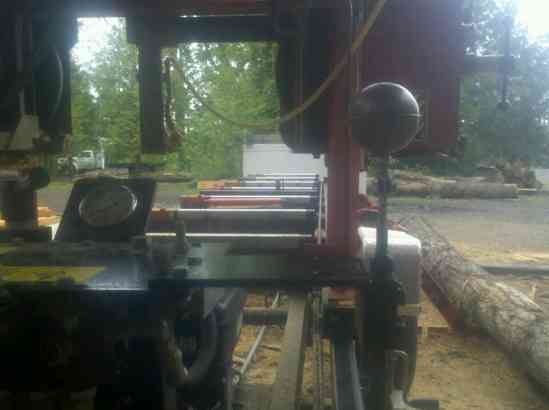 It has a lot of clamping power and will move all but the very heaviest of logs. The chain turner can assist in moving the really big ones. 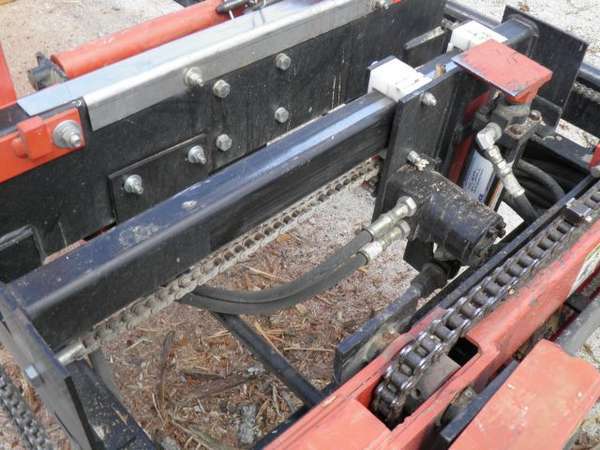 It can lift just about any log but only pops up 5" above the log deck, which means it can only flip smaller cants. Larry, I and perhaps some other 2000 owners have modified the clamp to rise up 11.5". The modified clamp works very well but some beefing up of the slider/mount is necessary since the factory slider/mount isn't stout enough to handle the increased torque of the taller clamp and will eventually fail.